Shishito peppers are a Japanese variety of small chilis. Though generally not spicy, every once in a while you might get one that has a touch of heat to it. Shishito peppers have somewhat thin flesh and very thin skin, and their taste has a delicate bitterness to it. 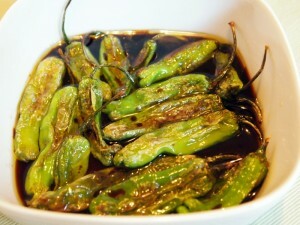 In Austin, you can get wonderful shishito peppers from Johnson’s Backyard Garden during the late spring/early summer. Try this super simple recipe as an appetizer or quick snack! Wash the shishito peppers in warm water, and then pat completely dry with a towel. In a large, heavy pan, heat 2 tablespoons olive oil over medium-high heat. While the oil is heating, mix the remaining tablespoon of olive oil, soy sauce, water, vinegar, and salt in a shallow bowl. Once the oil is very hot and moves freely around the bottom of the pan, throw in the peppers. Make sure to not crowd the pan – you only want a single layer of peppers (you can make additional batch if necessary). Let the peppers cook, without stirring, for about 1 minute. Stir quickly to move the peppers to an uncooked side, then let cook another minute. Continue cooking, stirring continuously for another two minutes. The skin of the peppers should be blistered and brown. Remove the peppers and place directly in the marinade. Let sit for about 5 minutes, then serve! Variation: Instead of using the marinade, you can just remove the blistered peppers to a small serving dish and sprinkle with coarse salt.